The Occupational Safety and Health Administration did not have enough workplace safety inspectors before Donald Trump arrived on the scene, and as with just about everything else, it’s gotten worse in Trump’s two-plus years in office. The number of inspectors has fallen to a record low in the history of the agency, and a new analysis by the National Employment Law Project shows how bad things have gotten: The number of complicated and high-penalty investigations OSHA does has fallen—but at the same time, fatality investigations have risen. The Trump administration’s story is that total investigations have risen. But that’s not helpful if what’s happening is that inspectors are being pushed to take on quick and easy cases rather than digging into the complicated or difficult ones. That’s just what’s happening, NELP’s Debbie Berkowitz, herself a former OSHA official, writes. “For example, when inspectors go onto a construction site, they can inspect multiple subcontractors all at once, but count each one as a separate inspection. They can get through these sites in a few hours, and count four to five inspections.” At the same time, inspections of concerns like musculoskeletal hazards, worker exposure to dangerous chemicals, explosion risks, and heat exposure have all dropped dramatically. OSHA is failing to conduct inspections of workplaces that have reported amputations—imagine that you lose a body part on the job and the government doesn’t even come to check out if your boss is running a safe shop. In at least two cases, poultry plants haven’t been inspected even after reporting two amputations or injuries requiring hospitalization in the course of just a few months. But the big red flag is this: In 2017 there were 837 workplaces inspected because of a work-related death or a catastrophe of more than three workers hospitalized. In 2018, the number rose to 929. The Trump administration is letting workplace safety inspector jobs go empty, it’s focusing on hasty inspections while the number of complicated investigations of serious risks drops, it’s failing to investigate amputations … but the serious thing that is rising is fatality investigations. That is very scary news for America’s workers. This blog was originally published at Daily Kos on March 14, 2019. Reprinted with permission. Trump hasn’t succeeded yet in passing a budget with significant cuts, so most of the reductions have come from hiring freezes, failure to hire political appointees, and increased retirements (accelerated by buy-outs) of disillusioned and frustrated career employees. But you’re not reading this to understand the national cataclysm; you want to know about the effects on workers and workplace safety and health. But tragically, what we’re looking at is not just government being drowned in a bathtub, but more workers actually dying in a bathtub. But while it is true that Acosta lifted the hiring freeze for OSHA inspectors, the process is anything but streamlined from what I hear from OSHA staff. Approvals for CSHO hiring are trickling out at a snail’s pace, barely keeping up with retirements. Second, the agency doesn’t live by CSHOs alone. As usual, with interviews, that was only a small part of how I described the impact on OSHA. OSHA is, first and foremost an enforcement agency. That means that in order to ensure safe workplaces, the agency must have sufficient staff to inspect workplaces to ensure that employers are in compliance with OSHA standards and other safe workplace procedures. And, ideally, the agency should have sufficient, up-to-date standards to provide a floor for workplace safety. The agency also has a robust compliance assistance program which formerly had a Compliance Assistance Specialist (CAS) in every one of OSHA’s 100 regional and area offices. Because of budget cuts over the past several years, however, many OSHA offices no longer have CASs. OSHA also needs enough whistleblower investigators to ensure that workers are allowed to exercise their health and safety rights without fear of retaliation. OSHA has never had enough staff to perform all of those functions adequately. The AFL-CIO reports that if OSHA were to inspect every workplace in the nation just once, it would take 159 years. And the situation has gotten significantly worse. Since 1980 when Ronald Reagan was elected, the number of workers in the economy has increased by 50% and the number of OSHA inspectors has shrunk by more than 45%. OSHA had 5.3 compliance officers per million workers in 2016, compared with 14.8 in 1980. So where are we today and what is the impact of Trump’s efforts to shrink government? Just hiring inspectors only addresses part of the problem. The hiring freeze continues for OSHA managers, administrative staff, whistleblower investigators and others. And this presents a major problem for workers. In a quest to keep the inspection numbers up, OSHA inspectors may focus on the “easy” cases. A construction site, for example, will yield more and faster inspections and citations than a workplace violence case, a major chemical release or a case involving musculoskeletal injuries. Just hiring CSHO’s and not filling managerial, administrative or legal staff just moves the bottleneck from the inspection itself, up the ladder.The larger and more complicated a case is, the more levels of OSHA (and Solicitor) review it must go through, and the greater likelihood that it will be challenged in court. If OSHA doesn’t have all of its ducks in a row, the case will be lost and if cases are lost in court because there isn’t enough managerial or legal staff to conduct a thorough review, it’s not just a legal problem, it’s a safety problem. The hazards will not be eliminated and more workers will get injured, ill or killed. And the failure to hire administrative staff means that instead of inspecting workplaces and managing cases, CSHO’s and supervisors spend their shrinking time inputting data, filing reports and doing all of the other administrative work that would better be done by administrative staff. Not exactly a good use of taxpayer dollars. And even if cases aren’t dropped for failure to meet the 6-month deadline, they will take longer to issue. And being as employers don’t have to fix the problems in their workplaces until the citations are issued, workers will be exposed to dangerous conditions for longer. A shortage of inspectors means that many offices only have time to react to worker fatalities and hospitalizations after they happen, rather than putting resources into pro-active planned (or programmed) inspections of high-hazard workplaces. Retirements don’t happen evenly across the agency. Some area and regional offices are hit much harder than others. But a hiring freeze reduces OSHA’s ability to staff up in those offices that are having the most shortages. Either the workers covered by those offices are under-served, or staff has to be temporarily assigned to the problem offices, further increasing the agency’s budget problems. This is patently false. OSHA hasn’t had a budget increase since 2010, and I can’t find anyone inside or outside of OSHA who can tell me what they’re talking about. The hiring freeze also remains for whistleblower investigators. About 60% of OSHA whistleblower cases address retaliation against a worker for exercising their health and safety rights, the other 40% fall under 21 additional whistleblower laws that Congress has given OSHA to enforce — everything from environmental laws, rail safety, nuclear power plants, the Sarbanes-Oxley Act and many others. Until the Obama administration, the whistleblower program had been neglected stepchild at OSHA — underfunded and ignored. Enormous progress was made over the 8 years of the Obama administration, creating a separate directorate, a separate budget item, making it easier to file complaints on-line, increasing staff, modernizing procedures, re-organizing management and reducing the backlog of open cases. Nevertheless, even with significant progress, the program remains troubled and underfunded, and the continuing hiring freeze threatens much of the progress made during the Obama administration with the backlog of open cases rising back to unacceptable levels. The Post also discusses the impact of Trump’s — as yet unsuccessful — plan to eliminate the Chemical Safety Board. The reports of the death of the CSB is most likely premature as both the House nor the Senate budget bills fully fund the agency for FY 18, but the threat nevertheless has an effect. Aside from the obvious hit on the staff’s morale, Board Chair Vanessa Sutherland describes how the CSB’s tiny staff has to spend time planning for its own demise, even while conducting its normal business of investigating chemical plant incidents. And although it’s not raised in the article, it will inevitably make it harder to attract (or retain) talented staff while the Sword of Damocles weighs over its head. So, you might ask, how does any of this make sense? Fourteen workers a day were killed in the workplace last year, and the number of workers killed annually has gone up for the last three years. Workplace deaths and injuries are estimated to cost between $250 billion and $360 billion a year, and OSHA’s current annual budget is a measly $552 million. The bottom line is that shrinking government is not just about reducing employees and “bureaucrats,” and saving taxpayer dollars; it means limbs severed and lives lost. But that doesn’t make me feel better. Because maybe they don’t want to keep it operating. This blog was originally published at Confined Space on December 31, 2017. Reprinted with permission. About the Author: Jordan Barab was Deputy Assistant Secretary of Labor at OSHA from 2009 to 2017, and spent 16 years running the safety and health program at the American Federation of State, County and Municipal Employees (AFSCME). 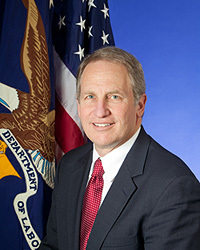 He has also worked for the House Education and Labor Committee, the Chemical Safety Board, the AFL-CIO and an earlier stint at OSHA during the Clinton administration.